The new Apple Watch hasn't shipped yet, but it's already running into some issues. Apple (AAPL) on Wednesday confirmed the new Apple Watch Series 3 is having problems connecting to LTE networks. "We have discovered that when Apple Watch Series 3 joins unauthenticated Wi-Fi networks without connectivity, it may at times prevent the watch from using cellular," an Apple spokesperson told CNN Tech. "We are investigating a fix for a future software release." The built-in cellular connection, a first for the Apple Watch, has been a major selling point for the Series 3. The watch is designed to rely less on the iPhone, and lets users answer calls, get texts, talk to Siri and access third-party apps without being tethered. Soon, users will be able to stream Apple Music from the device. The tech giant unveiled the Series 3 last week, alongside the iPhone X, iPhone 8 and iPhone 8 Plus. The latest watch also has a bigger focus on fitness and health. For example, it alerts users when it detects an elevated pulse. In addition, it's launching an Apple Heart Study later this year with Stanford Medicine to identify irregular heart rhythms. 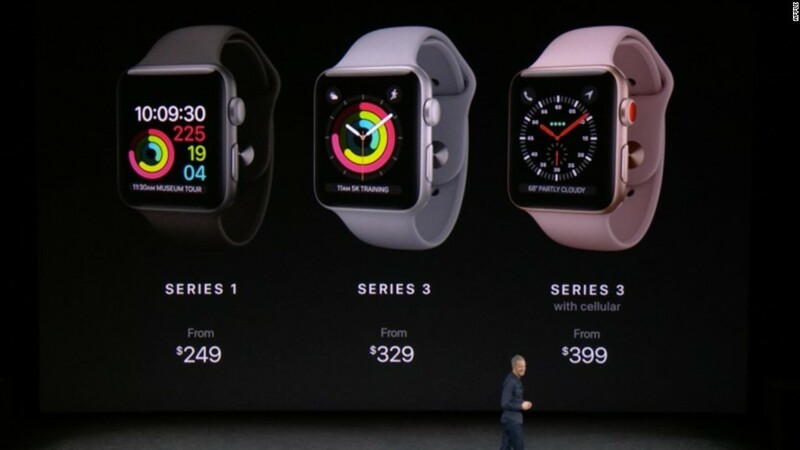 The Series 3, available in stores starting Friday, will cost $329 without cellular and $399 with cellular.